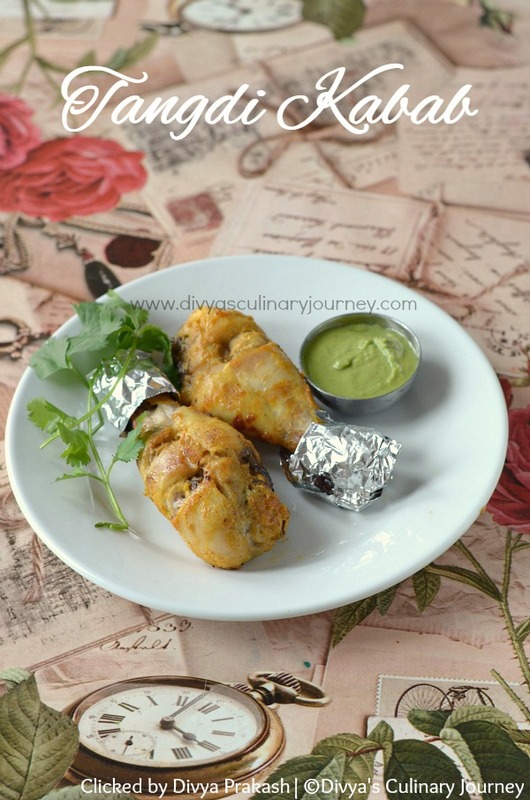 Today I am going to share a South Indian style Kootu recipe using Brussel Sprouts. It is only after coming to UK, I have started experimenting with Brussel Sprouts. Every time we get it, I would either roast them in the oven or make a simple stir fry with it. I must admit that my kids are really not a fan of this vegetable and they would make a big fuss to eat it. They only eat the oven roasted ones when they are warm but not later when it is cold. Hence once in a blue moon we would get brussel sprouts specially for my hubby who loves it. This time when we got it, I decided to try a simple South Indian style recipe with it and made kootu with Brussel Sprouts. It came out as a tasty and comforting dish. Even my kids ate it without any complaints this time. After noon I served it as a side dish for rice and in the evening the left over was served as side dish for chappathi. Today I am here with Tangdi Kabab Recipe. It is nothing but the chicken drumsticks are marinated in hung yogurt and spices for few hours and then they are cooked in tandoor (clay oven). But I baked / roasted them in oven and it came out well, my kids loved it. They can be served as an appetizer or as a snack. Today I am here with Avarakkai Paruppu Usili Recipe. 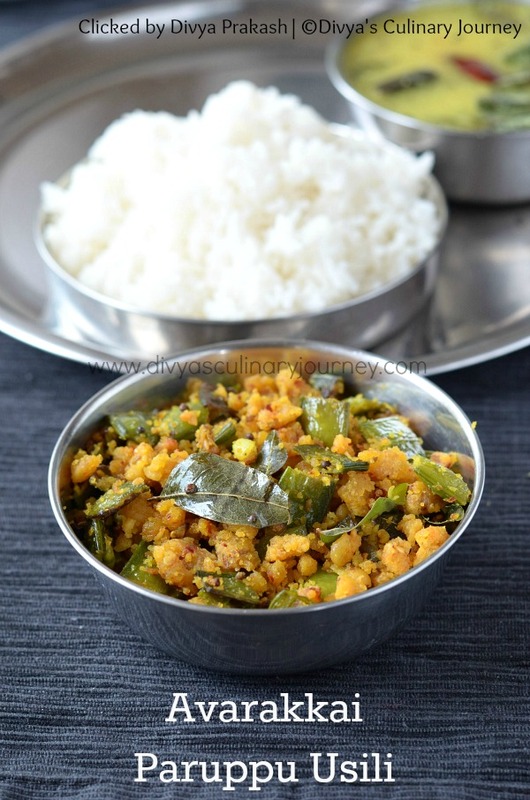 It is South Indian style stir fry made with broad beans and lentils. This stir fry is vegan and is healthy. The lentils are soaked and ground coarsely and are steam cooked and in the mean time the broad beans are cooked till it is tender and then both are stir fried and can served as a side dish for rice along with gravy of your choice. I served this avarakkai paruppu usili with Vendakkai Mor kuzhambu. I feel this is a very comforting combination. Today I am here with Vendakkai More Kuzhambu. 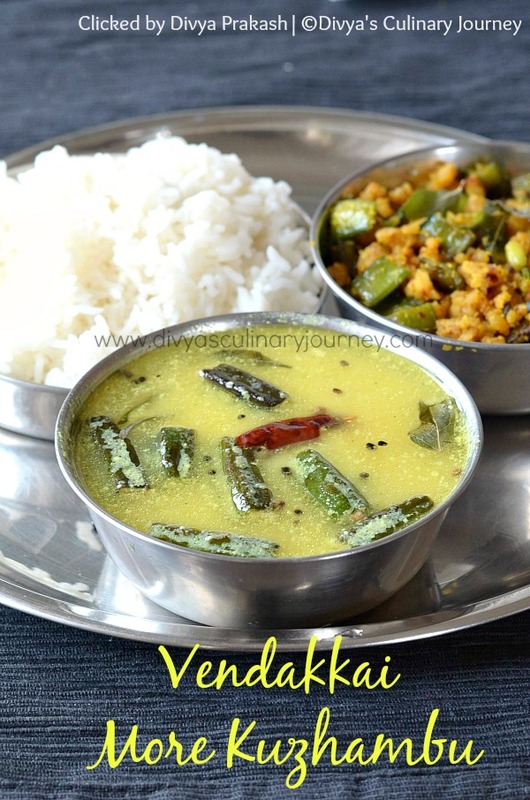 It is a traditional South Indian, yogurt based gravy similar to North Indian Kadhi. I have already posted Rajasthani Gatte ki kadhi. I wanted to post Mor kuzhambu recipe for a long time but couldn't do it. It is very easy to make and takes very less time to prepare. I made mor kulambu with ladies finger / okra, but other vegetables like ashgourd, chow chow can be used too. This gravy can be served with rice and any side dish of your choice. I served it with avarakkai Paruppu usili. 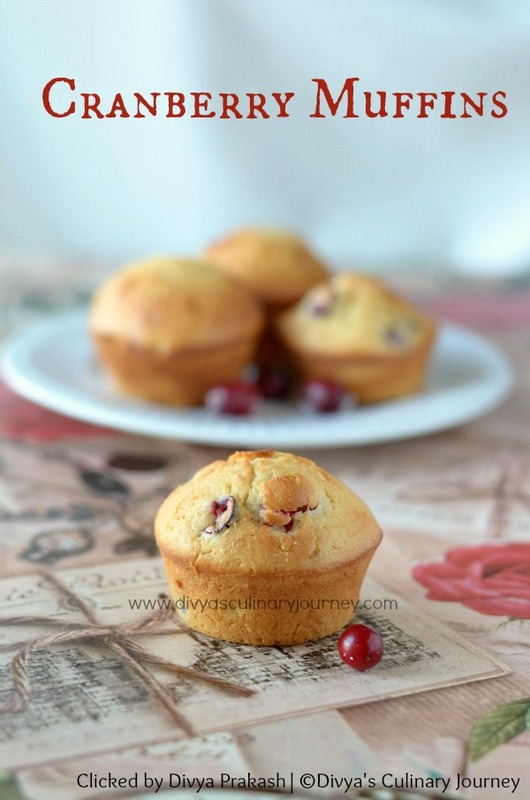 Today I am here with Fresh Cranberry Muffins recipe. I must admit at our home, we all love cranberries- be it fresh or dried. But here in UK I couldn't get fresh cranberries at all, except during Christmas time. I got super excited seeing them and got it then and had made Spiced cranberry cake for New year and had saved some cranberries for later and baked these muffins. My children loved it so much. But since fresh cranberries may not be available through out the year, it can be replaced with dried cranberries too. Today I am here with South Indian style Prawn Fry recipe. My daughter loves prawns so much and she has been demanding for it for a really long time. 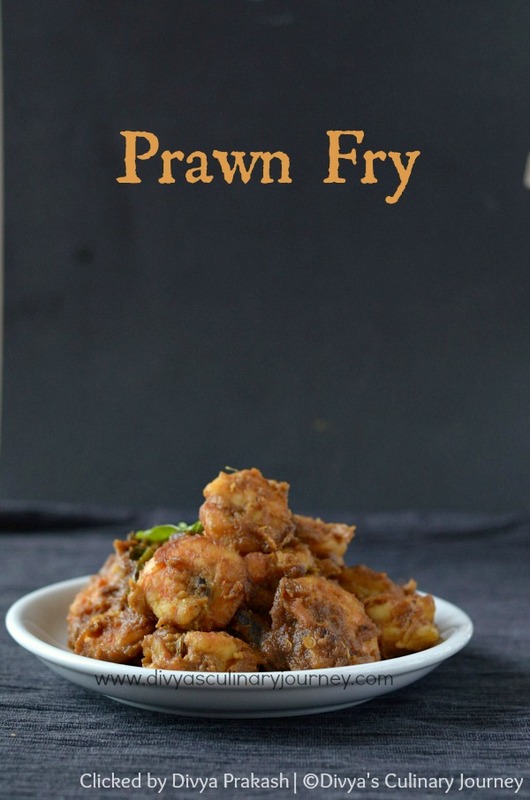 Finally, this weekend could get prawns and I prepared this super easy and tasty prawn fry and she loved it. With Prawns, cleaning them properly is most important. I made a video of how to clean the prawns. This can be had with biryani, mild pulao or as side dish for rice and gravy. Today I am here with Parangikai Kootu Recipe. Parangikai is nothing but Yellow Pumpkin(Manjal Poosanikai) and in my home town it is also known as Arasanikkai. This vegetable is slightly sweeter and has lot of health benefits. My mom makes Sambar, Kuzhambu, Poriyal etc., with this vegetable. I am yet to try them but prepared Kootu with manjal poosanikkai recently and my hubby loved it. The bright orange color of the vegetable made it attractive for my kids, they ate it without any complaints too. This Kootu can be served as a side dish by making it semi dry and also make it stew consistency and serve as gravy for rice. 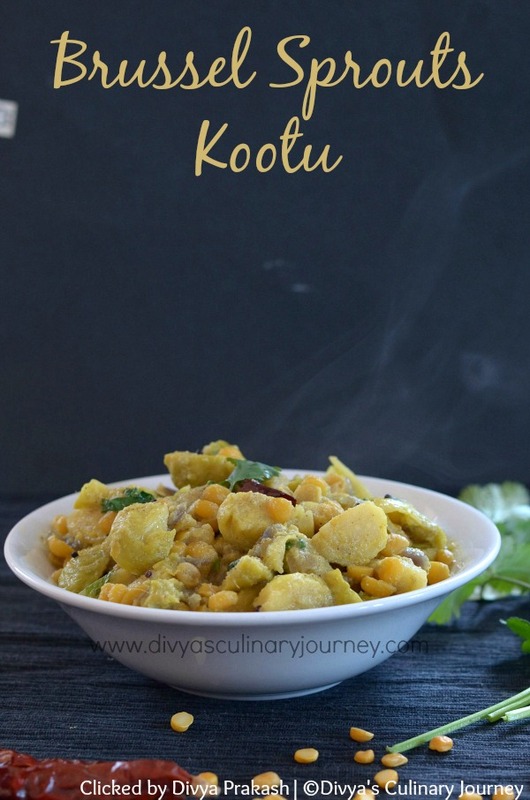 I have tried making kootu with both chana dal and moong dal and both versions were good. If planning to serve this as a side dish I would make it with chana dal and if serving as a gravy with rice then I would add moong dal. It is just my choice. You can add either one as per your preference. 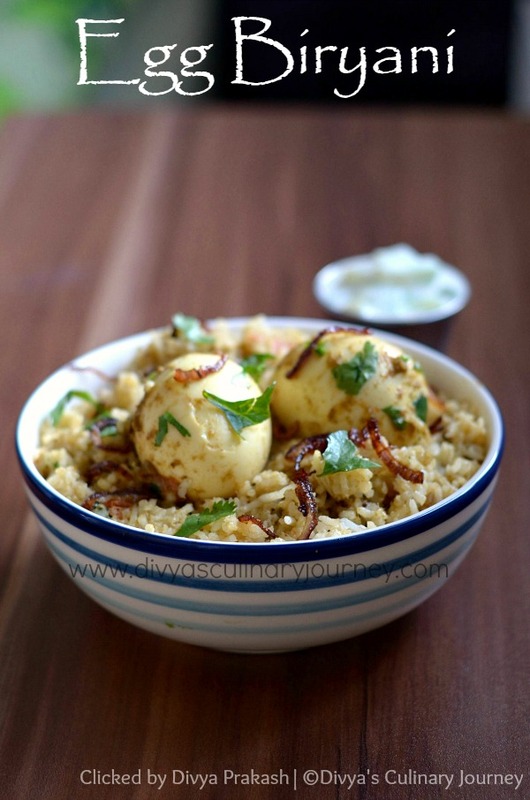 Today I am here with Egg Biryani Recipe. This biryani is made using Dum method. I have been wanting to post this recipe for a really long time but has been always in a hurry and could never spend the time required for this dum biryani which is a fairly elaborate process unlike the pressure cooker biryani. Rice is cooked till it is about 85% done, the masala gravy is prepared and simmered with boiled and shelled egg and then in a heavy bottomed pan, layers of rice and gravy is made along with the eggs, then they are sealed so that the steam doesn't escape and cooked in low heat for the flavors to marry and in few minutes, flavorful biryani is ready. It is a lengthy process but totally worth it. Today I am here with Thinai Paal Payasam. This payasam is made with Thinai Arisi (Foxtail millet Rice) instead of raw rice unlike the usual paal payasam. I have been experimenting a lot with millets in the recent days but most of them haven't made to the blog yet, except for Thinai Ven Pongal which I posted few months back. 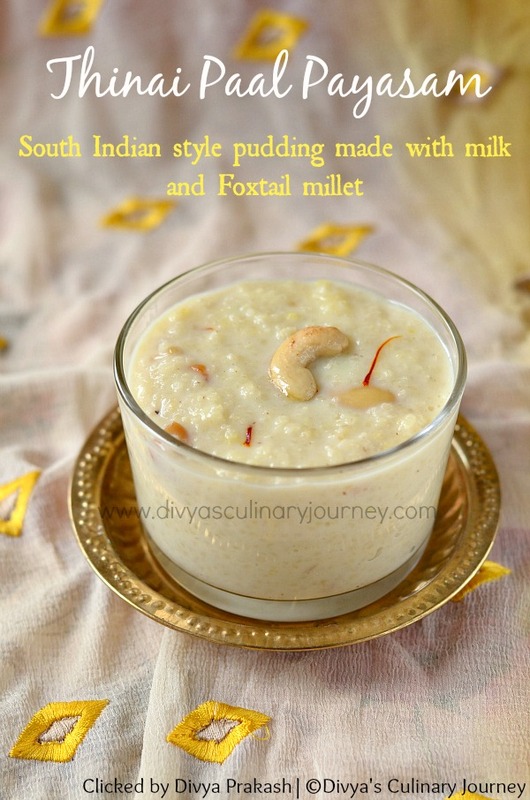 This Thinai payasam is very easy to make and is quite delicious. Thinai Rice cooks faster so I prepared this payasam in a pan. Today I am here with Potato kurma recipe. 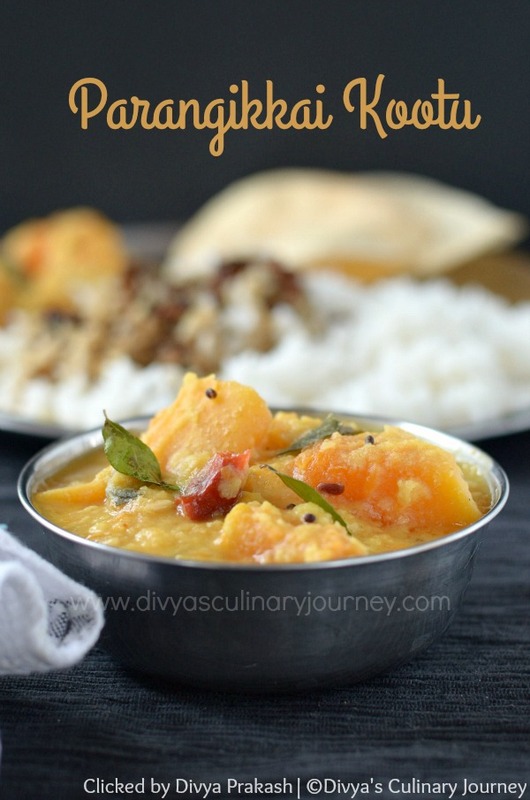 This is a mildly spiced, flavorful coconut based gravy made with potatoes. This kurma can be had with chappathi/ roti, idli and dosa too. I usually prepare kurma for serving with chappathi but sometimes have it with rice too. 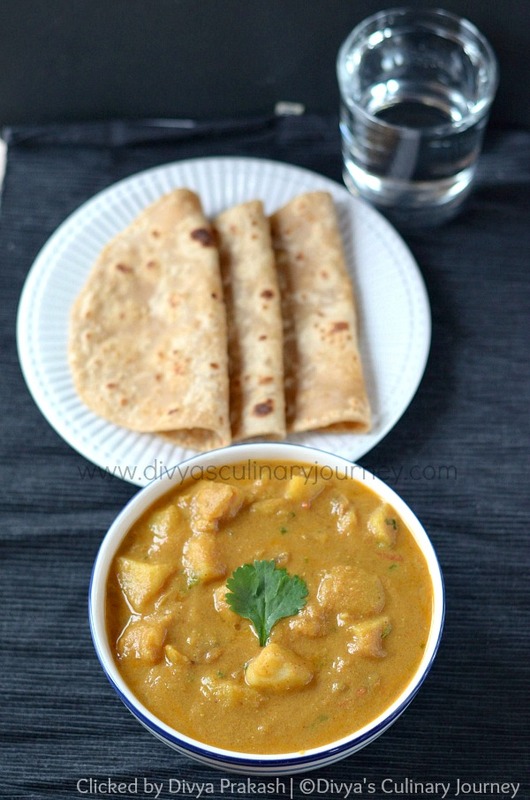 This flavorful kurma is easy to make and is lip-smacking good. When kurma is prepared with their favorite potato, my kids will finish their plate without any complaints. Today I am here with spiced cranberry cake recipe. This cake is made in bundt pan using fresh cranberries and warm spices, making it perfect for baking during the holidays. This is the cake I baked for our New year's celebration this year. I read somewhere that cakes baked in ring shape (like bundt cakes) are very lucky when baked for the new year day. I am not sure if it is true or someone has made up the story but I thought this would be the right time to use my bundt pan which had been lying untouched for a really long time. We love cranberries a lot - both fresh and the dried ones. When I saw fresh cranberries in the store, I couldn't resist myself from getting it. I wanted to bake with these cranberries in the bundt pan. 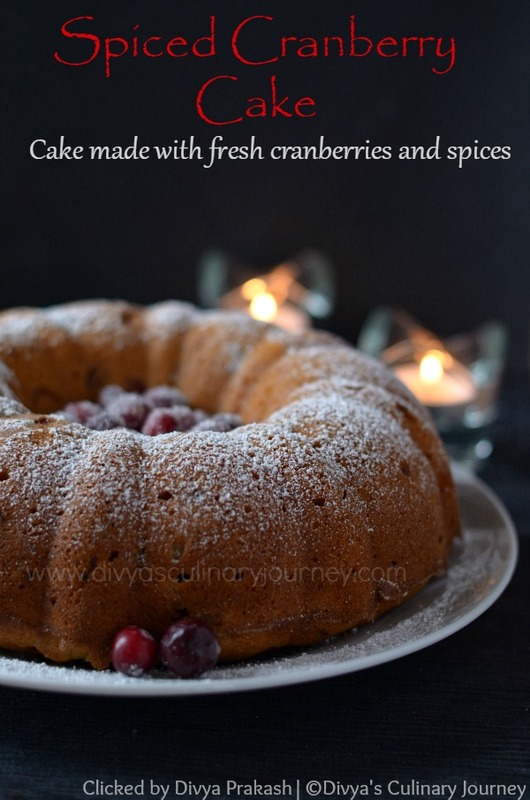 I have already posted a bundt cake recipe with cranberry - Cranberry Coffee Cake, the cake that I baked for 2014 new year. So this cake I wanted some variation and decided to use spices and nuts. I didn't do much decoration for the cake, except dusting it with icing sugar and then added some sugared cranberries. Everyone at home loved the cake.